Getting to Kona is no easy feat, what was your qualification process like to make this year’s event? I qualified through Ironman Langkawi last November. Langkawi is a fabulous race on a tough and challenging course (like Kona in some ways without the wind). Qualifying for me was not straightforward as I was not able to run for many weeks before the race due to injury. After the bike I was in second in my age group. Normally I would move up places on the run but in Langkawi it was about setting a very conservative pace and getting that qualifying spot. I finished 5th in my AG and got the slot!! There were 5 available and it rolled down to 6. We understand this is your first trip to the Ironman World Championships in Kona, how does it feel to be in Hawaii and what are your expectations for the race? It feels like a dream to be in a place I have read and heard so much about and a place that has hosted so many epic battles in the past. I was out practising the course in advance of the race to prepare for those winds that can change suddenly on the bike. For the race my expectations were for the heat, hills and winds to be tough and for me to respect the course, the elements and to put in a performance to be proud of. Could you give us some insight into the equipment you use for Ironman and why you use them? Swim: Roka speed-suit for the time advantage over non speedsuit. Bike: Canyon Speedmax 9.0 SL – beautiful fast responsive bike. Run: Asics Hypertri – super light running shoes where any moisture in the feet wicks away through the hole in the sole. So Colin, how did it go? In short it went well. I finished 22nd in my AG with a time of 9.27. Normally my fastest leg is the swim but it was not in this race. Out of the three legs this was the hardest for me. I got caught up in the washing machine start and had a real tough time the first 10-15mins, towards the second half I got better with less people but all in all it was a poor swim for me with a time of 56 mins. The lesson learnt was not to underestimate swimming with this number of people and also to think more of where on the start line to be if racing Kona again. Onto the bike, traditionally my weakest leg, the strategy was to be just below race target splits in the initial sections so I would have the strength to fight against the notorious winds on the Queen K on the way back into Kona. The first third of the course we had tailwinds on the Queen K so it was pretty fast riding, then the headwinds started picking up towards Hawi and the effort increased. The race was going according to plan and energy was good through following my nutrition strategy. 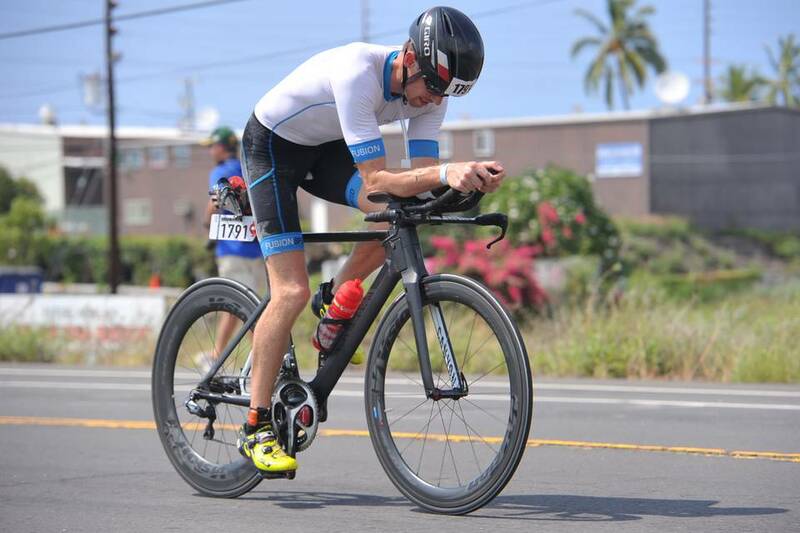 The last 40-50km was very tough back to Kona but I held it together and put together a 5.09 bike split. At this stage I think I was about 70th in my AG. For the run the strategy was to conserve pace and energy on Ali Drive for the first 16km and then once on the Queen K section to open up a bit. This was the strategy I followed and I felt good on the run. I adopted a strategy of stopping for 20-30 seconds at each aid station for cold water, sponges and gels. This aided greatly in keeping my body temperature down and also mentally of having little small targets ahead to complete instead of thinking of the long way to the finish line! I kept passing people and pushed a bit more on the final stretch into town. In the end I crossed the line with a run split of 3.14 giving me an overall time of 9.27 and 22nd in my AG. What advice would you give to an AG looking to make it to Kona? The advice I would give is be committed to your training. It is best to look for consistency rather than have one big week of training and not much training the next week. We need to build a solid base and foundation of training and then push on from there. For most people the journey to Kona will not be immediate so be patient and give it time. When seeking qualification it is best to pick the right race in terms of weather conditions, course profile and number of slots available. My immediate plans are a few weeks off and then I will be competing in Ironman 70.3 Phuket at the end of November. For 2018 my plan is to race a bit more than 2017 so I will be doing a lot of the local events together with 70.3 events in the region and beyond. For individuals hoping to qualify for the IRONMAN World Championships, you should not miss out!